Francisco De Zurbarán (1598-1664), St. Francis in Meditation (1635-39), Oil on canvas. National Gallery, London, 162 x 137 cm. Larger image. 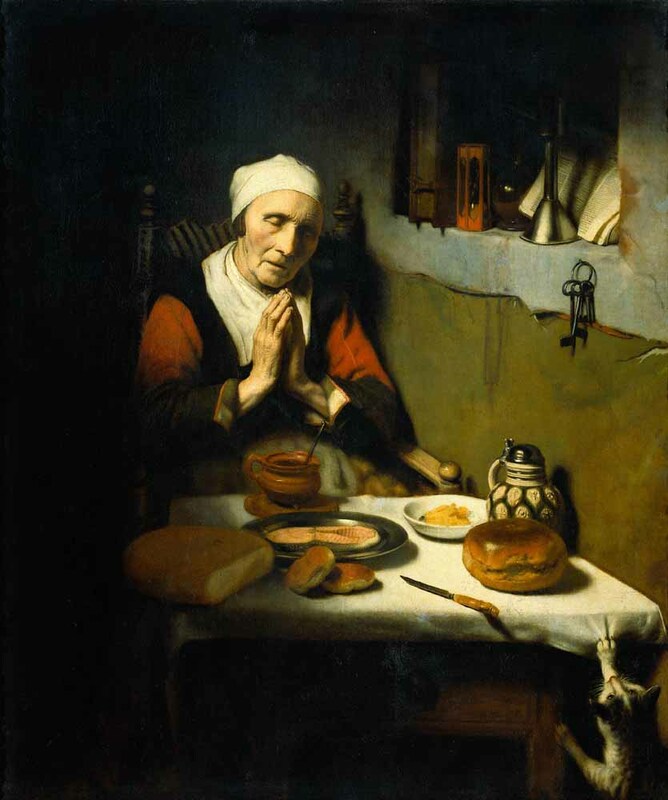 Nicolaes Maes (Dutch painter, 1634-1693), Old Woman at Prayer, known as "Prayer without End" (1656), oil on canvas, 134 x 113 cm, Rijksmuseum, Amsterdam. Aert de Gelder (Dutch painter, 1645-1727), Old Woman Praying (c. 1700), Oil on Canvas, 35.63" x 30.91" (90.5 x 78.5 cm.). 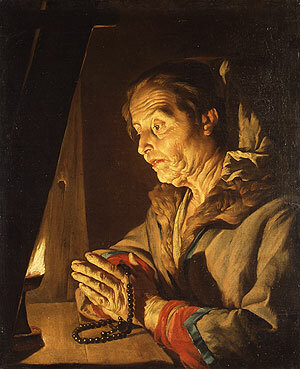 Matthias Stom (Dutch, c. 1600- c.1649), Old Woman Praying, oil on canvas; 30 5/8 x 25 1/8 in. 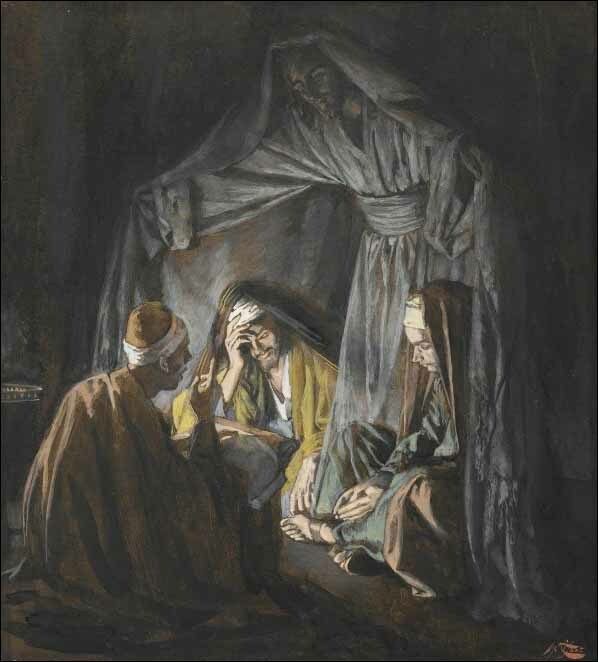 (77.8 x 63.8 cm), Metropolitan Museum of Art, New York. 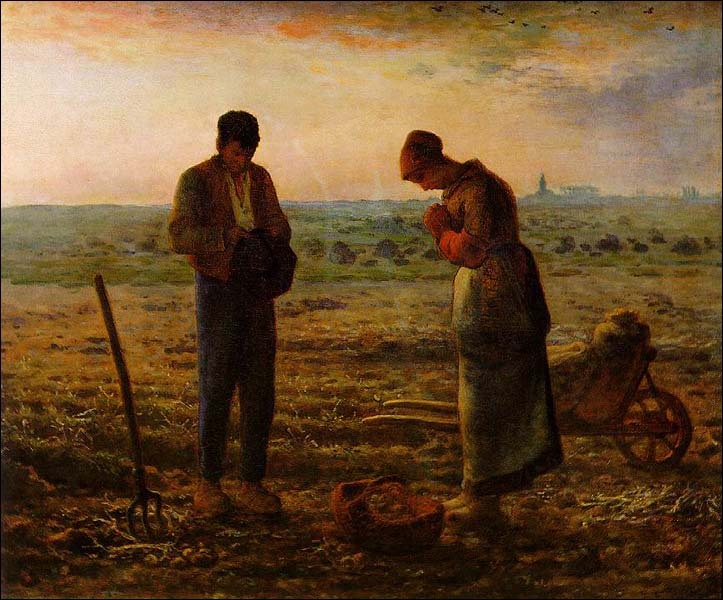 Jean-François Millet (French Realist Painter, 1814-1875), "The Angelus" (El Rezo del Angelus, 1857-59), oil on canvas, 55.5 x 66 cm, Musee d'Orsay, Paris. Moving painting of farmer and wife in field thanking God for his provision during potato harvest. Another. Marc Chagall, The Praying Jew, 1923, oil on canvas, Art Institute of Chicago. 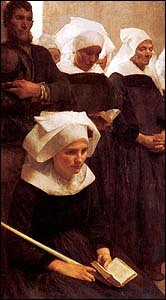 Pascal-Adolphe-Jean Dagnan-Bouveret, Bretons praying (1888), oil on canvas, 124x85cm, private collection. 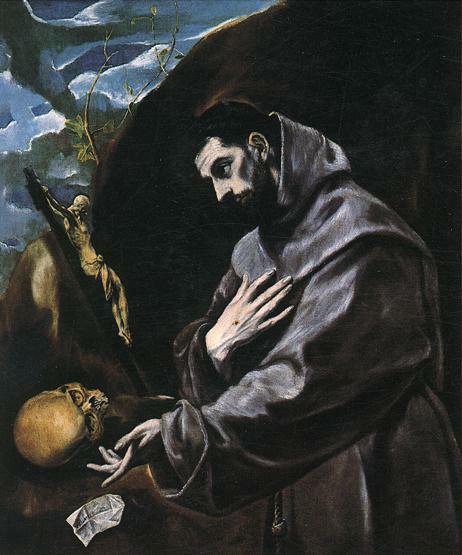 El Greco (1548-1614), St Francis Praying (1580-85), oil on canvas, 116 x 102 cm, Joslyn Art Museum, Omaha. (1032 x 749 mm), Vatican City, Musei Vaticani. 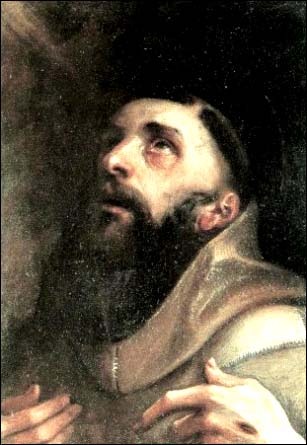 Annibale Carracci (Italian painter, 1560-1609), St. Francis of Assissi (1585-90). Larger image. Francisco De Zurbarán (1598-1664). Several striking paintings of St. Francis of Assisi in prayer. Meditation of St Francis (1632), Oil on canvas, 114 x 78 cm, Shaw Collection, Buenos Aires. St. Francis in Meditation (1635-39), Oil on canvas. National Gallery, London, 162 x 137 cm. Large. 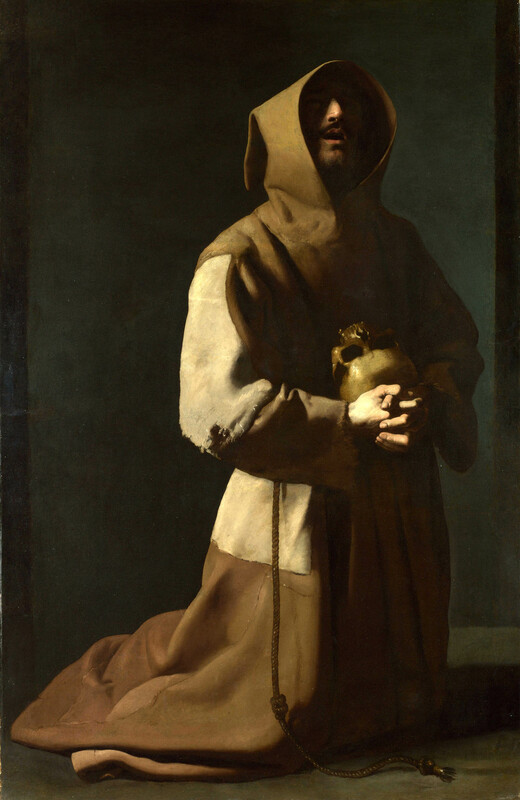 *San Francesco d'Assisi (1645), Museo BB.AA Lione, France, Olio su tela 197 x 106 cm. San Francesco pregando (1641-58), Col. Plácido Arango, Madrid. Olio su tela 127 x 97 cm. A number of St. Francis images on this site. The Ecstasy of St. Francis (1635-40). National Gallery, London, Olio su tela 152 x 99 cm. 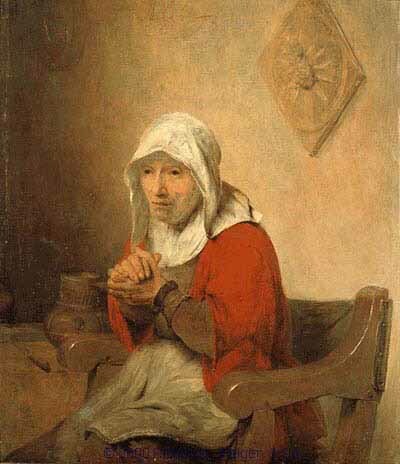 "Old Woman Praying," by Matthias Stom (Flemish painter, 1600-c. 1649), oil on canvas; 30 5/8 x 25 1/8 in., Metropolitan Museum of Art, New York. Larger image. Bartolomew Esteban Murillo, Saint Francis of Asisi praying (1645-50), Oil on fabric. 182 X 129 cm., Onze-Lieve-Vrouwekathedraal, Antwerp. Mic Carlson, contemporary painter and illustrator, has a number of paintings of St. Francis, with a beautuful study of Francis praying. Follower of Caravaggio, anamorphic Saint Jerome Praying, 1635, oil on canvas. Circular distortion. St. Jerome Kneeling in Prayer (1635), Etching. Signed and dated. A 19th century impression of the only state. B. 102; H. 140; BB. 35-H4 1/2" x 3 1/8". Madonna in Prayer (1640s), oil on canvas, Accademia Carrara, Bergamo. Agony in the Garden (1508), engraving. Agony in the Garden (1510) woodcut, 127x98mm, "small passion" series. Nice detail of Christ praying. Agony in the Garden (1497, woodcut, 39 x 28 cm, "large passion" series. Detail difficult to discern from background. "Ancestors of Christ: Hezekiah - Manasseh - Amon" (1511-1512), Sistine Chapel, Vatican. Hezekiah is either dozing or praying. 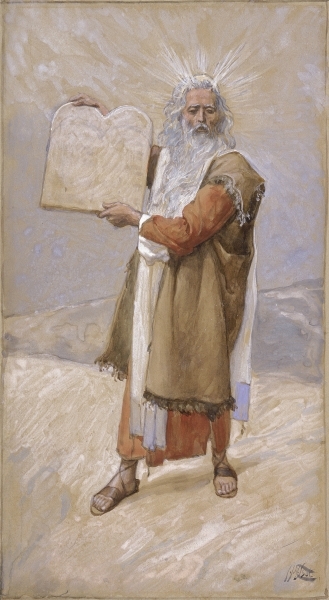 "King David" (1858-64), from The Seed of David, King David (1858-64), watercolor on paper support, 279 x 127 mm, Tate Collections. J.H. Hartley, in James Bailie and J H Hartley (illustrator), The Bible Story a connected narrative retold from Holy Scripture (A & C Black Ltd., London, 1923). 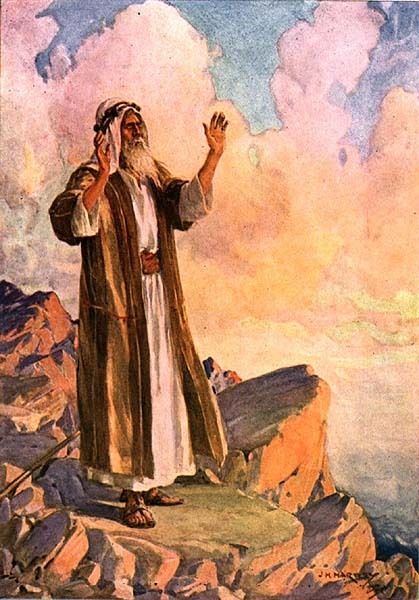 Moses Praying on Mt. Pisgah (1922) (clipart.com collection, color, #1050661). 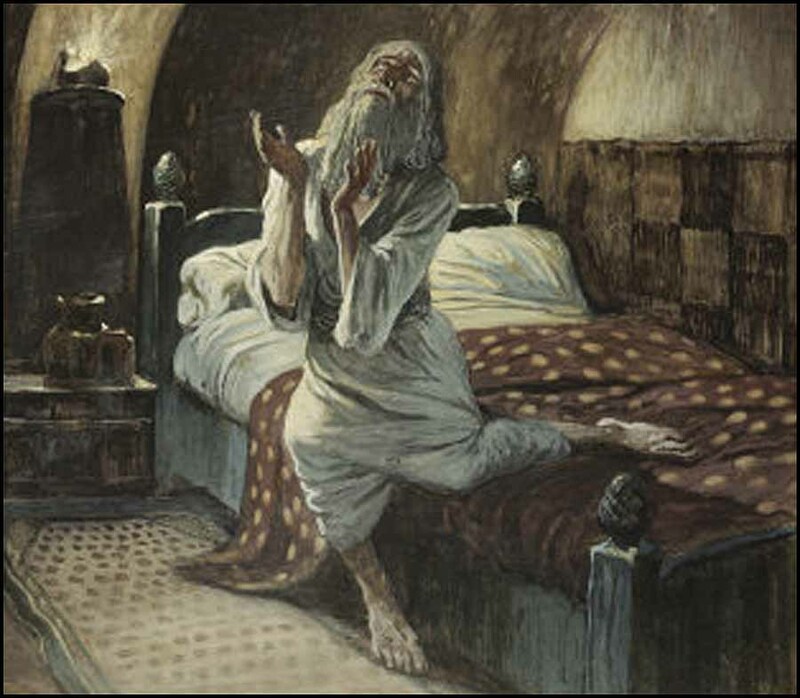 James J. Tissot (1836-1902, French artist and illustrator), "David Praying in the Night," gouach on board, Jewish Museum, New York. Tissot, James J. (1836-1902, French artist and illustrator). Other works. 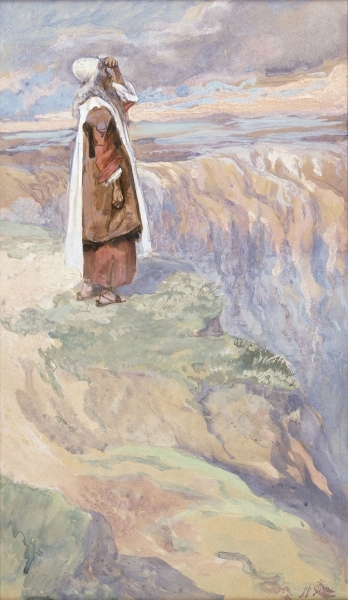 Moses Sees the Promised Land from Afar. 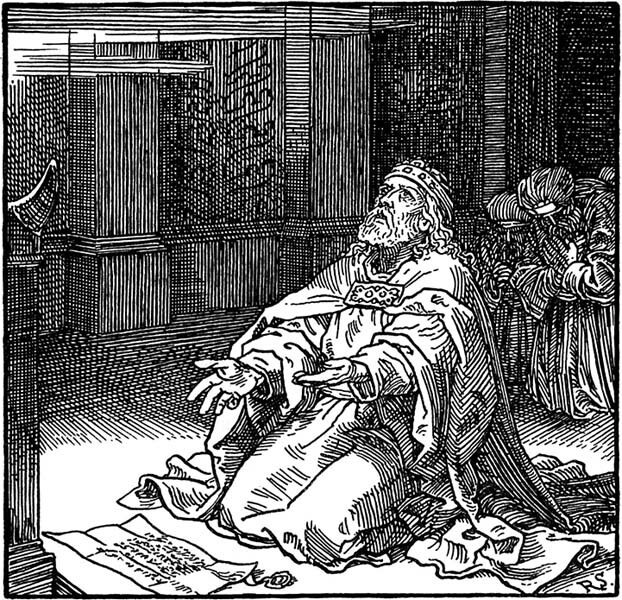 Moses Kneeling in Prayer at his Household (clipart.com, b&w, #168682). Jennifer Anderson (contemporary UK artist), Prayer, oil on canvas, 54x28 inches. 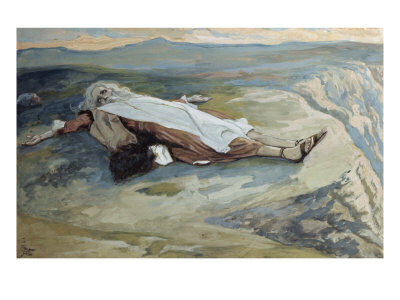 Brian Jekel (contemporary LDS artist), Gethsemane's Prayer. Jack Hammer (Cartoonist), Honoring Praying Mothers. BW cartoon. Pam McCabe (contemporary artist), Three Girls Praying, popular poster. Original in pastel. 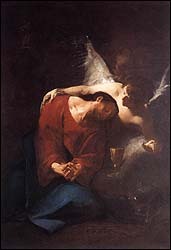 (contemporary artist), Christ Praying, print. Muh Faisol (contemporary artist), Berdoa (Praying) (2001), oil on canvas, 70x90cm. Vadim Koltun, Praying man (2003) oil on canvas, sold as posters. Richard McBee (1947- ), contemporary artist, New York City, Abraham Praying (1996), Ink & Gouache (10 ¾ x 14). 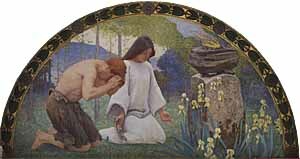 Unknown artist, Kneeling at Prayer Wall. Unknown (asian?) 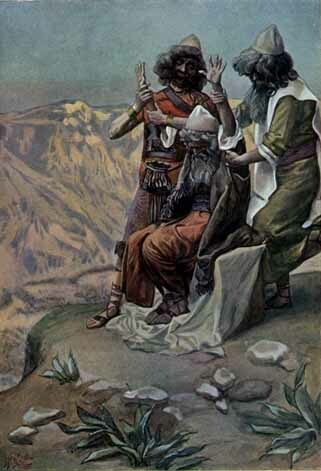 artist, Nehemiah praying for Jerusalem, Crossmap illustration #1224698795. Eric Enstrom (American photographer, 1875-1968), "Grace" (1918), sepia photograph, later handpainted in oils by the artist's daughter Rhoda Nyberg. Copyrighted image. Image of white-bearded old man praying with clasped hands over a table with a loaf of bread, soup, and a Bible. Sir Edward Poynter (English neoclassical painter, 1836-1919), Daniel's Prayer (1865), from Illustrations for `Dalziel's Bible Gallery'. Relief print on paper, image: 190 x 175 mm, on paper, print. Tate Collection. RUBENS, Pieter Pauwel, Daniel in the Lion's Den, c. 1615, Oil on canvas, 224.3 x 330.4 cm, National Gallery of Art, Washington. Daniel looks terrified and naked. Daniel's Answer to the King (1890), oil on canvas, 74x47-7/16 inches, Manchester Art Gallary, UK. 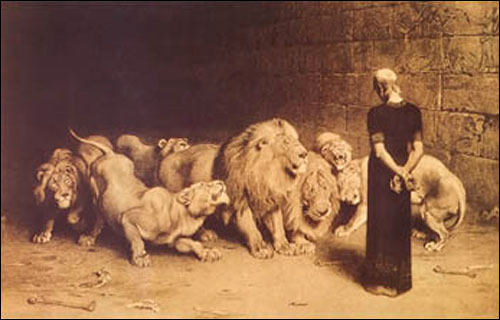 Daniel in the Lion's Den (1872), Walker Art Gallery. Paul Troger (Austrian Painter, 1698-1762), Christ comforted by an angel (c. 1730), oil on canvas, Museo Diocesano, Camerino. Larger image. William Blake, The Agony in the Garden (c. 1799-1800), Tempera on copper, Tate Collections. Heinrich Hofmann (1824–1911), Christ in the Garden of Gethsemane. Well known image, but prayer looks quite passive, no agony at all. Idealized. Gerrit van Honthorst, Christ in the Garden of Gethsemane, Oil on canvas. 113x110 cm, Holland. c1617. State Hermitage Museum. Unknown contemporary, from Vie de Jésus Mafa, black Christ with engaging hands, sleeping disciples. Warner Sallman, Christ in Gethsamene. Idealized. Carl Heinrich Bloch (Danish painter, 1834-1890), Christ in Gethsamene, The National Historical Museum at Frederiksborg Castle. Comforted by an angel. Striking painting, sorrow rather than agony. Kathryn Barnes, contemporary painter, Christ at Gethsemane, portrait. Oils on canvas. Tracey Clark, contemporary artist, Christ At Gethsemane, sienna on toned paper / 24" x 20", 1998. Striking drawing of Christ in a fetal position, ministered to by an angel. Catches the idea of agony in prayer better than almost any I've seen. A related drawing, Christ In The Wilderness, sienna on toned paper / 25.5" x 18", 1999. James C. Christensen (1942- ), Gethsemane (1984), oil on panel, 40" x 44".Striking depiction of Jesus in earnest prayer backed up by an angel behind him.BYU graduate. 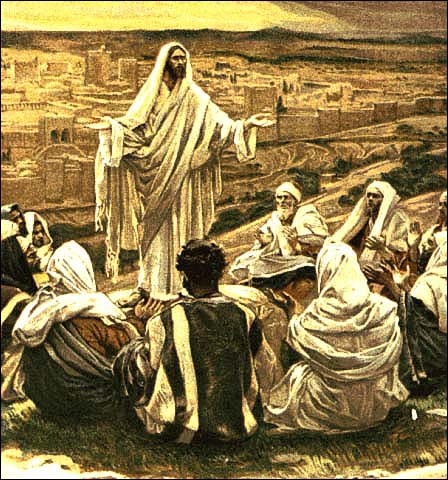 David at Prayer and Worship, section in Biblical Art on the WWW.